Made in the late 1800's and still in totally excellent condition (Tiff & Co introduced the classic engagement ring in 1886). The diamond is of old European cut with a small open cutlet and is of "very good cut" by today's GIA standards (I've never seen a euro cut diamond this well cut and symmetrical); it sparkles like crazy, it's like a star! Comes with GIA grad appraisal (Greg Taylor, GIA since 1975) It is 0.57ct, VVS2 clarity and J-K color (but it sparkles soooo much it looks pretty white to me even compared to my E-F colored diamonds). Insane quality for it's time for sure!!! The diamond is set in platinum on a 19k yellow gold shank (acid tested) which is stamped Tiffany & Co. The platinum prong setting is sure to stand the test of time even longer; the gold band is in no way worn down and is quite thick sideways). Ring size approx 5.75 - 6. This is a handmade Silver Georgian engagement ring. 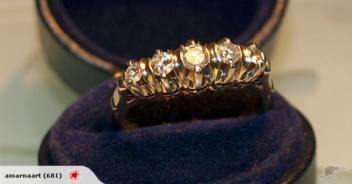 The ring is in excellent condition giving the fact it was made early in the 1700's! 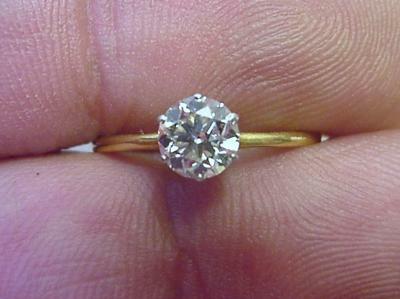 Tiffany & Co Antique Diamond Engagement Ring Later 1800s!!! Here is a follow up picture of the T & Co Hallmark for this amazing ring. It is still in excellent condition despite its 120yrs old or so. All five of the Antique Diamonds in this Platinum Diamond Ring sparkle like crazy! This ring was made in France during the Art Deco 1920s era. All the matching European cut Diamonds are essentially positioned in lavish Platinum with a curvaceous French 'Fleur de lis' gallery holding up the diamonds to further enhance the aesthetic grace of this absorbing French Antique Platinum Diamond Ring. The 5 European cut Diamonds make a total weight of .51 points and have a personality of there own! This beautiful piece of antique wedding jewelry was made in the 1920s and is in very good to MINT condition. For a lifetime of wear, look for platinum jewelry stamped with a mark of 950 Plat or Plat. You can still make out the Plat mark inside this ring. This indicates a level of purity that will not tarnish or wear down. 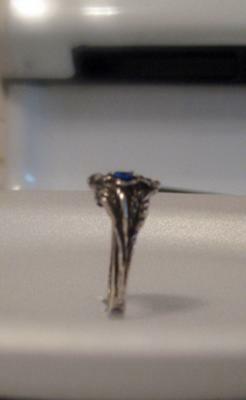 The ring is size 8 US or P 1/2 and the inside diameter is approx. 18.1 mm. Guaranteed to be as described! An insurance valuation for $9,300.00 AUD is included. Can be shipped to most countries. Really nice diamond band with three rows of round cut sparkelers. Est.size of diamonds-2mm-bead set in 14kt.yellow gold. Size 7-gently pre-owned. A bold ring! $300.00 or make offer.